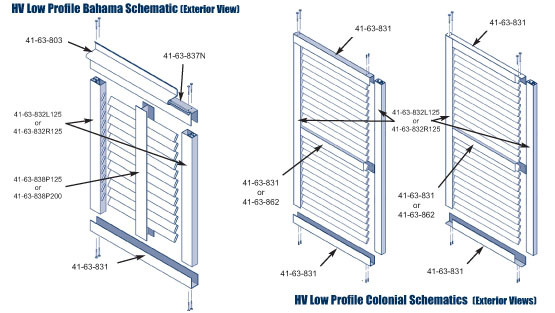 Increase the LEED rating of your GREEN Project with the HV Low Profile Decorative Bahama Colonial System from EMS. The Low Profile system provides shade for commercial or residential applications. It's mechanical design makes it fast and easy to assemble. 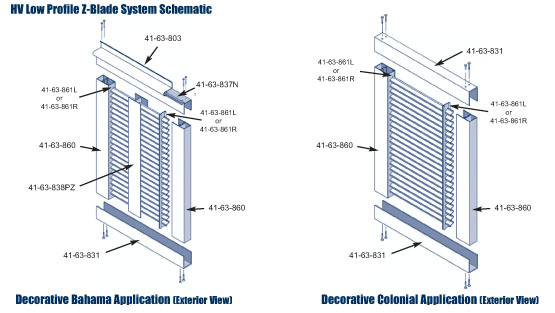 Pre-fabbed side rails & mullions eliminate the need to mechanically fasten the blades, resulting in labor reduction of over 50% compared to traditional Bahama shutter assemblies. It's mill finish allows the fabricator the flexibility to match colors to the building design after assembly. It's perfect for mixed-use projects such as open air malls, restaurants, business parks or anywhere you want to achieve and an upscale look while providing a low maintenance, durable product for years to come.